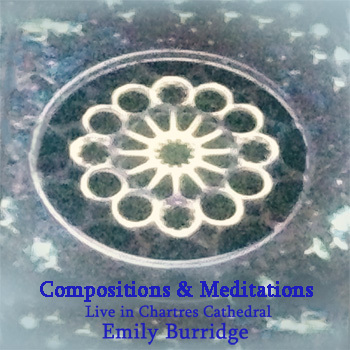 Compositions consists of five pieces from Emily Burridge's 'Music from Out of the Blue' series and is a live recording of a Sunday evening summer concert in the nave of Chartres Cathedral 17/07/2016 . Meditations is a selection of four improvisations born out of spatial resonance and the formation of melody in various locations within Chartres cathedral. I have always been fascinated by how a certain note will resonate more than others according to the dimensions of a structure no more so than within the acoustics of churches and cathedrals. The pieces of music recorded on this production all derive from situations whereby I have been invited to perform with my cello in various locations within Chartres cathedral. To record these moments was really just an experiment so as to enable me to reflect later on improvisations born out of the resonance of particular notes in different acoustics and ambiences. In improvising and performing in various locations within Chartres cathedral with its awe inspiring structure and immense history of prayer and music you are put into a humbled frame of mind. In each location the ambience of the sacred space has dictated the melody, with me as the musician feeling like the quill of a scribe following the resonance of notes that suggest the key and then a melodious piece has been born out of an improvisation. 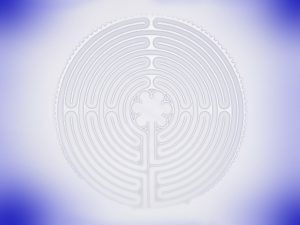 "Labyrinth Walk part 1 & 2" evolved while providing musical accompaniment for pilgrims walking the Labyrinth 09/07/2014 . "Mass in Memoria" is an improvisation recorded in the Sacristy shortly before performing Bach during the three minute silence at the Mass 17/07/2016 for the victims of the tragic act of terrorism in Nice. The recording of the Bishop singing the Mass was being relayed to the Sacristy through a little speaker. This piece of music is dedicated to the victims of the Nice tragedy. Jim Garrison of Ubiquity University for his invitation for me to be artist in residence for the Wisdom school Chartres retreat 2014.